The inspiration for this cake came, of course, from Pinterest. 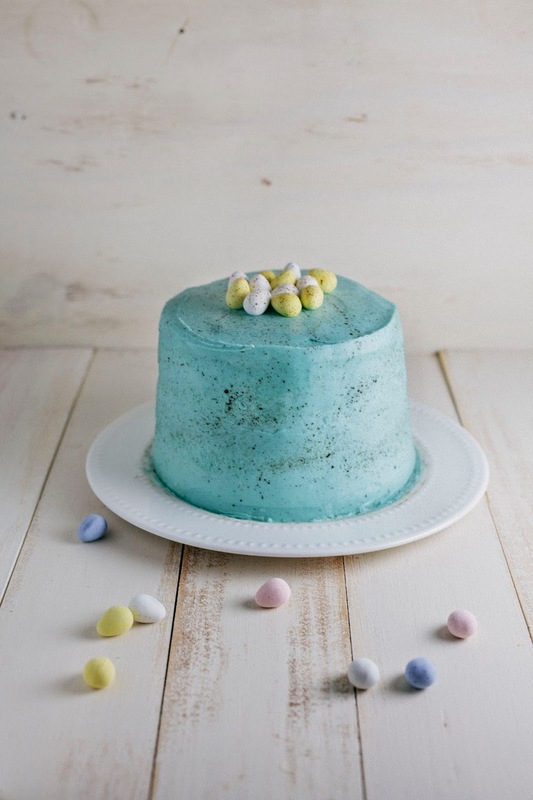 This beautiful Speckled Egg Cake has been popping up on my feed every now and then, giving me delusions of grandeur that I could somehow recreate it myself. But oh, how mine pales to the original! As if the Pinterest Fail blog didn't serve as warning enough — I should've known that their perfect and adorable version would be unattainable for a home baker like myself, especially since The Cake Blog specializes in wedding cake decoration and lots of fondant work (something I thoroughly tend to avoid because I think fondant tastes like plastic). Although the original recipe claims to use vanilla buttercream instead of fondant, I don't buy it. In any case, today's cake taught me that I'm not much a fan of overdecorated cakes that are supposed to look like other things; instead, I prefer ones that are natural and rustic like this yellow birthday cake or this tres leches cake. 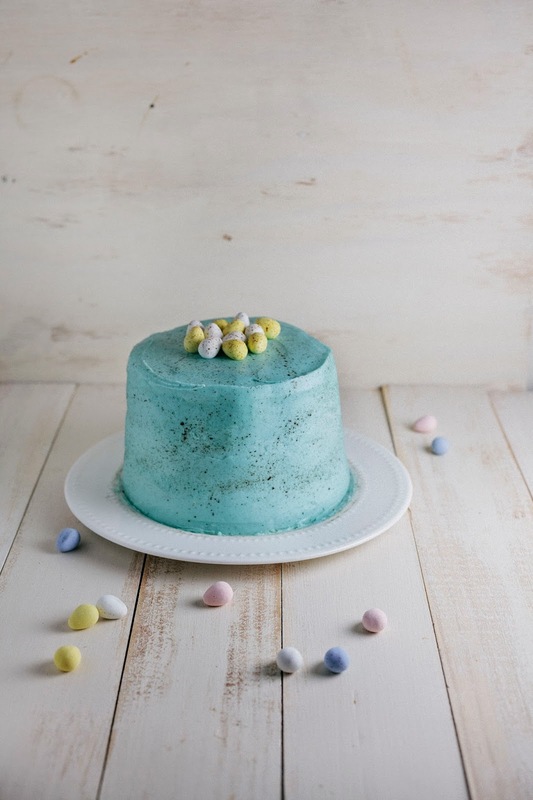 Despite my qualms with how this Easter Egg Cake looks, I'm sharing the recipe with you guys anyway. Not only because of the upcoming Easter holidays, but because it tasted absolutely delicious and, as a result, came in first place at my company's talent show. Three layers of delicate lemon cake, with tangy, homemade lemon curd in the middle and cream cheese frosting to sweeten the package. This cake is a PRODUCTION. Unless you've got a full day to dedicate to this, I suggest dividing the process between three days. On the first day, make the lemon curd. On the second day, make the lemon cake. On the third day, make the buttercream and decorate the cake. Alternatively, you can also use store bought lemon curd — I won't judge. If using a store bought curd, be sure to pick a particularly tangy one as the frosting is quite sweet and needs to be balanced out. To see step-by-step pictures on how to create the speckles on the cake, head on over to The Cake Blog for their process shots. I'll try and include process shots if I ever embark on this sort of cake decorating adventure again (highly unlikely, given my rant above), but I was strapped for time in this particular case. 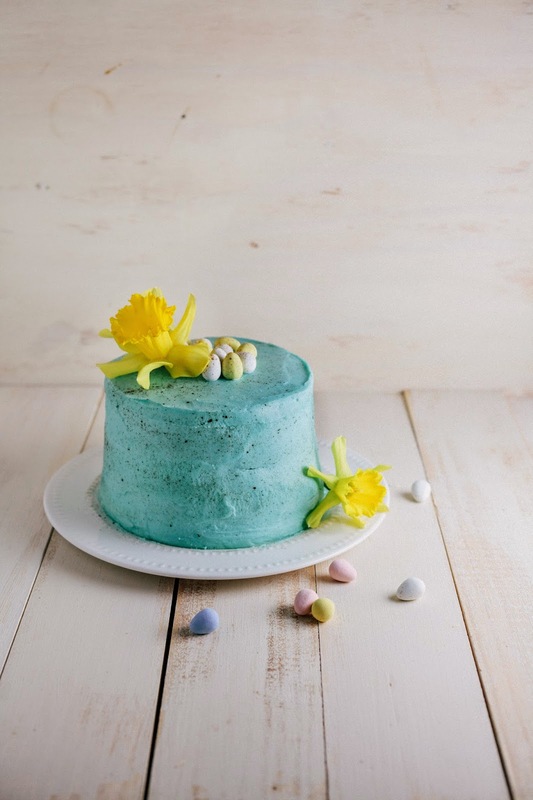 For the speckles, you'll need a clean, never-used-before paintbrush which you will use to splatter the cake. In a medium, heavy bottom sauce pot, combine 8 large egg yolks, lemon zest, 1/2 cup plus 2 tablespoons lemon juice, and 1 cup granulated sugar. Whisk to combine and cook over medium-high heat, stirring constantly until the mixture reaches a temperature of 160 (F). When the curd is ready, it should be able to coat the back of a spoon. When the curd is ready, remove the sauce pot from heat. Add 1/8 teaspoon salt and 1/2 cup plus 2 tablespoons butter one cube at a time, whisking until smooth. Cover with plastic wrap, pressing the plastic wrap directly onto the surface of the curd to prevent a skin from forming. Refrigerate until chilled and set, before transferring to an airtight container. In the airtight container, the curd will last up to 1 week. In a small bowl, combine the zest of 2 lemons and 1 1/2 cups granulated sugar. Use your fingertips to rub the zest into the sugar — this will release lemon oil from the zest and make your sugar more fragrant and flavorful. Set aside. Center a rack in the oven and preheat to 350 (F). Prepare 3 six-inch cake pans by spraying generously with cooking spray and lining the bottoms with parchment circle rounds; spray the parchment paper as well. In a liquid measuring cup, gently whisk together 4 large egg whites and 1/4 cup milk. Set aside. In the bowl of a freestanding electric mixer fitted with a paddle attachment, combine the sugar (from the first step) with 3 cups cake flour, 1 tablespoon plus 1 teaspoon baking powder, and 1/4 teaspoon salt. Mix on low speed for 30 seconds to blend. Add 3/4 cup unsalted butter and the remaining 3/4 cup milk, mixing on low speed until the ingredients are moistened, before increasing to medium speed and beating for 1 1/2 minutes to aerate and develop the cake's structure. Use a rubber spatula to scrape down the sides, before turning the mixer down to its lowest speed and gradually adding the egg mixture in 3 batches, beating for 20 seconds after each addition to incorporate the ingredients and strengthen the structure. Use a rubber spatula to scrape down the sides and mix into the mixture by hand. Transfer the batter evenly into the prepared pans. Bake in the preheated oven for 30 to 35 minutes or until a skewer inserted into the center of the cake comes out clean and the cake springs back when pressed lightly in the center. Transfer the cakes to a wire rack to cool for 10 minutes, before inverting onto the racks to cool completely. In the bowl of a freestanding electric mixer fitted with a paddle attachment, beat 6 ounces cream cheese and 2 teaspoons lemon extract on medium speed until smooth, about 3 minutes. Add 1 cup butter and a pinch of salt and beat, scraping the bowl as necessary, until mixed. Reduce the mixer speed to low and gradually add 1 pound confectioner's sugar a quarter cup at a time, beating on low speed until blended. Increase the mixer speed to high and beat until light and fluffy, about 2 minutes. Once the frosting is light, creamy and fluffy, reduce the mixer speed to its lowest setting. Color your buttercream frosting with a few drops of food coloring — I used 2-3 drops of Americolor's Sky Blue gel, which is what the Cake Blog recommended. When tinting buttercream, be sure to add just one drop of color at a time until you reach the right shade. Remember that buttercream naturally darkens slightly as it sets. Frost your cake with a 1/2 cup of buttercream to create what's known as a "crumb coat" — at this point, it doesn't have to be perfect. We just need to "seal" the cake so that it'll be easier to frost when covered with this initial crumb coat. Chill in the refrigerator for at least 1 hour, until the frosting crusts. Use an offset icing spatula to cover the crumb-coated cake with the remainder of the buttercream frosting. Smooth and shape to your liking and try to get the frosting as smooth as you can. It helps to have a jar of really, really, really hot water nearby to dip your offset spatula into occasionally as you frost. This is the secret to smooth frosting jobs. In a small bowl, mix together 1 tablespoon unsweetened cocoa powder with 1 1/2 tablespoons vanilla extract. Stir well until the cocoa powder is completely dissolved and you have a thin, chocolate paint. Cover your work area with wax paper. Lightly dip your new paintbrush (see baker's notes) into the chocolate "paint" from the previous step. Holding the paint brush with one hand, gently flick the bristles with your index finger to splatter the chocolate paint onto the cake. Be sure to hold the paintbrush fairly close to the cake. It also helps to practice first onto your wax paper until you get the hang of it. A little chocolate paint goes a long way, so dip your brush lightly! To see the process, be sure to head to the Cake Blog for step-by-step pictures. Oh my god this is the most beautiful cake i've ever seen! It's actually pretty cute. It's no where close to a fail. Nice work on the frosting. I don't know what you're talking about - I think this is a totally beautiful cake! very nice ! I love this colour ! Happy Easter to you ! I have seen this cake floating around Pinterest for months now. I have pinned it myself but I do not dare venture into the speckled egg butter cream territory! Kudos for attempting it and NOT failing at all! Thank you so much for bringing Pinterest Fail into my life!!!! I don't see what you're on about! It looks fab! 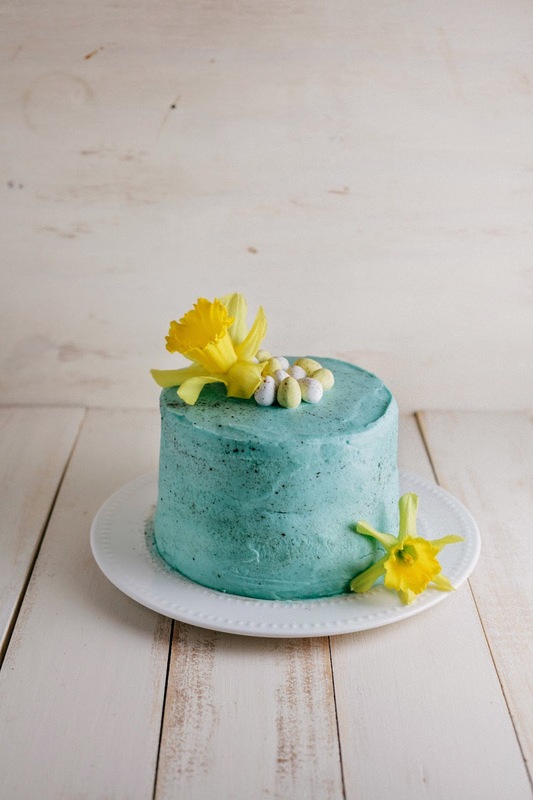 This has to be one of the most gorgeous springtime cakes I have ever seen! I love that blue color, and the decorations are just lovely. Beautiful job!